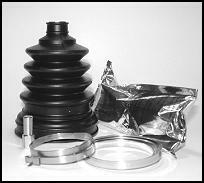 The Lightning-Boot is a high quality, economy priced ATV CV Boot that is manufactured in the USA. Only high quality materials are used so the boot will provide a long service life. The Lightning-Boot features a patented “continuous convoluted” design to minimize wear. Each Lightning-Boot kit comes complete with a Lightning-Boot, stainless steel clamps, CV grease, hex banding tool, and detailed instructions.